Nintendo recently began sending email surveys to a few Super Mario Run players who linked the iOS game with their My Nintendo account, MacRumors has learned. 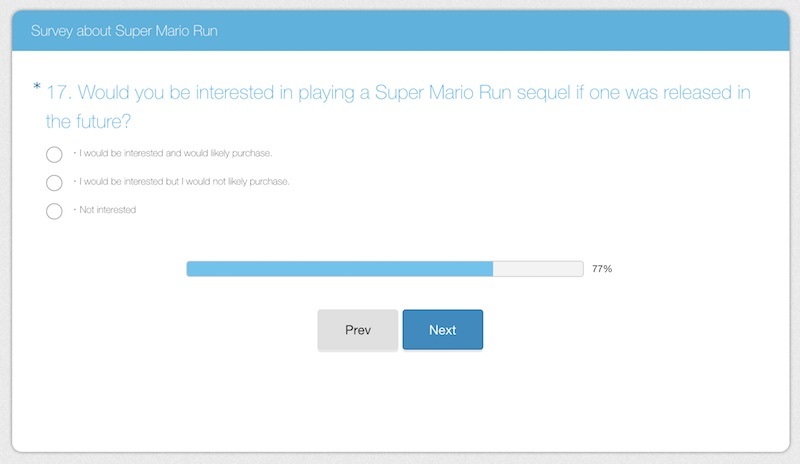 The 10-minute long survey asks basic questions pertaining to how users found out about the game, what modes they liked, and how much they are willing to pay for a game like Super Mario Run. The survey fluctuates between multiple choice and written answers. The survey's construction and questions are similar to the ones Nintendo used to give out to Club Nintendo users so they could receive points to spend on exclusive merchandise from the company. Now, it appears Nintendo is aiming to discover for itself what players think of Super Mario Run, following a week of press that mostly centered around the opinion that $9.99 is too high a price for the amount of content presented within the game. With the new survey, players can now give Nintendo their own thoughts on the matter. One of the questions even asks if users would play a sequel to Super Mario Run "if one was released in the future." As of now, Nintendo is supposed to be gearing up to announce more information on the launch of Animal Crossing and Fire Emblem for iOS, both said to debut before March 2017 if the company's original plan from 2015 remains intact. The negative reactions to the pricing structure and online requirements of Super Mario Run have gone so far as to cause Nintendo's stock to lower earlier this week, with players rating the game a 2.5/5 on average on the App Store. Although news has been scarce, in May it was reported that Animal Crossing and Fire Emblem would adopt the free-to-play model, with users able to purchase in-game items and boosts of some kind after downloading at no cost. Miitomo -- Nintendo's first true iOS game -- was free-to-play, but the user base slacked off precipitously after launch, with data suggesting "users didn't really get" the game and its basic, social network inspired gameplay loop. Super Mario Run [Direct Link] got its first update this week, introducing a new "Friendly Run" mode where players can compete against ghosts of friends and family members, with the caveat that no coins or Toads can be collected during each run. There's also a few new holiday-themed items in the Kingdom Builder shop. $3.99-$4.99 one time purchase. IAPs need to die. Oh, offline, is needed too. Volume is where the money is at. They are perfectly positioned for it. $10 for a Mario game is a steal. People are being ridiculous. I loathe IAP, it's made for sheep. But we live in a sheep world, so behhh. Also, get rid of the online requirement, Nintendo. Corporate stupidity at its finest. I'm fine with $10 up front from the iOS store. I'm not ok with the IAP. They really should do a Christmas sale - one day only, Dec 25th. 50% off full game. i dont mind paying , but i want a proper mario game not something that does almost everything automatically for me. I hardly ever buy apps because most of the App Store is a wasteland of IAP crap. People got spoiled and want everything for free. It's no wonder developers don't want to make the effort or build crap that robs you blind when they do put something out. I shudder to think what the survey responses will be. I've resigned myself to just playing games on my 3DS XL and have given up on anything besides hidden objects games for my smart phones. I'd rather pay as much as $20 for a truly excellent game upfront than download a "free" app that costs more in IAPs to make it tolerable. I lost count of the time I wasted on games I found out were a chore to play without a constant outlay of real cash for special coins. Nintendo probably did shoot themselves in the foot making a persistent online connection a requirement to play this game. I hope that becomes apparent to them in the survey. Maybe if they made an actual Mario game - not another water down auto runner garbage. Even in 1986 we could control Mario. Taking a survey on what customers want to pay ? If I had to take a guess, most will want it for free.